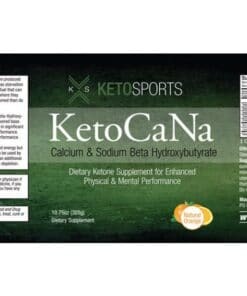 KetoCaNa by KetoSports contains 11.7 grams of the ketone body Beta-Hydroxybutyrate (BHB). Consumption of KetoCaNa before exercise can result in significant increases in performance and heighten mental acuity. KetoCaNa is similar to the Ketoforce product in that it contains the endogenous ketone body beta-hydroxybutrate (BHB). It differs in that it is a powdered product not a liquid and is therefore more portable. It uses sodium and calcium BHB salts instead of Ketoforce’s sodium and potassium salts. Consumption of KetoCaNa before exercise can result in significant decreases in oxygen demand and increases in performance. KetoCaNa may also heighten mental acuity and performance. KetoCaNa is excellent for ketogenic dieters who need energy but must limit carbohydrate intake. 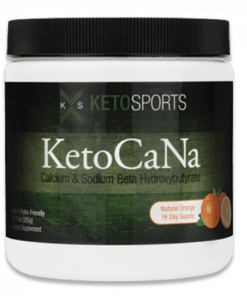 KetoCaNa may also be used by individuals who consume carbohydrates to provide an additional energy source and limit exercise induced glycogen depletion. It may also be used to ease the transition into a ketogenic state. 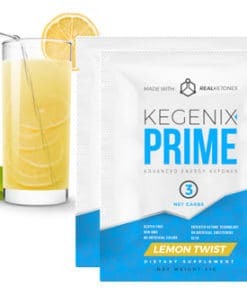 It may help alleviate the fatigue and lethargy some experience while making the transition from a glucose to a ketone metabolism. Q: Are there any side effects of KetoCaNa by KetoSports use? A: Initially use of salts can cause some temporary GI upset until acclimated to use. Additionally, since this product contains salt, all users should limit additional salt intake. A: No. It is naturally flavored and sweetened and has a pleasant orange taste. A: KetoCaNa is a powdered product and therefore very portable. It contains sodium and calcium BHB salts and should be dissolved in eight ounces of water for use. It is naturally flavored and sweetened and has a pleasant orange taste. A: If you are already in ketosis we recommend taking 1 heaping scoop (in 8 oz of water) 15 minutes prior to working out. 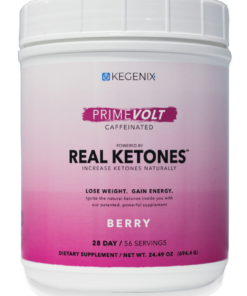 It stays in your system and will provide your body with elevated ketone levels for up to 3 hours. When taken as a pre-workout, it has been shown to decrease the amount of oxygen consumed at a given power output. A: If you are transitioning into a state of ketosis then there is a loading phase. It is recommended that you take three servings per day for two to three days. One of these servings should be 15 minutes pre-workout. Q: When is the best time to take KetoCaNa? A: Approximately 15 minutes before you engage in exercise or in the morning if fasting or before eating. Q: What is the shelf life of KetoCaNa? A: This product’s shelf life is three years. Q: Is KetoCaNa vegan and/or kosher? A: Read more about macros using Maria Emmerich’s Keto Calculator or check our Keto Ideas blog to keep up to date with ketogenic developments, news products, books, podcasts and more. Decided to take the plunge into the world of exogenous ketones to fuel long distance endurance events, primarily Ironman triathlons, whilst maintaining a ketogenic diet (have been fat adapted for 2 years). I’ve previously tried just MCT oil with a slow burn carb source but never felt like I nailed the nutrition part properly and always felt the need for sugar at the end of the run! I tried the KetoCaNa today during a long bike ride on a route consisting of 4 laps of 40km. I definitely felt stronger on the last lap and my average lap times improved. I didn’t change anything else so it’s looking promising and look forward to including the product for my next race. Obviously not cheap, but I figure approx £5 for a few hours of ketones is not bad when compared to the sugar alternatives and resulting GI distress. Also, wanted to mention the excellent service from Ketosupplements.co.uk. Sara was very helpful via email and my order was delivered free and very quickly. Great taste and very predictable result in terms of feeling the ketone boost.